Soil: prefers moist but well-drained, acidic soil or ericaceous compost in a pot. 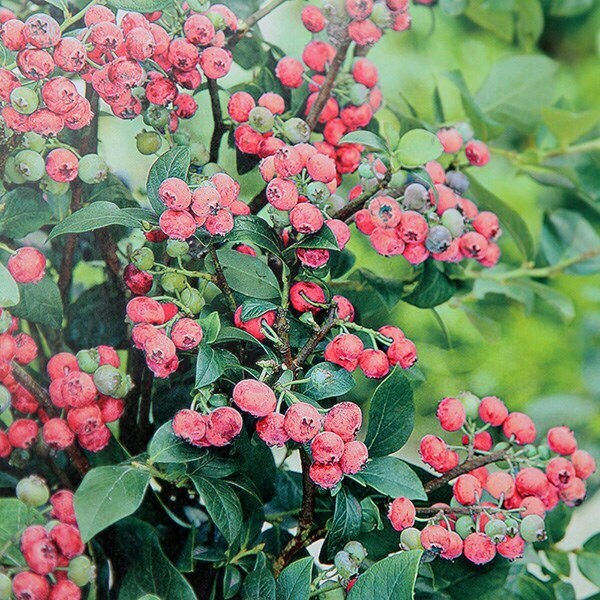 A new, easy to grow and fascinating plant, that will produce delicious pink blueberries! The fruits form without the need of a pollination partner, after the bell-shaped, pinkish-white flowers (which appear in spring) have faded. Initially a pale green, they first become flushed with pink, but turn a deep pink when they are fully ripe and ready to pick. A mid-late to late-season blueberry, the berries have a lovely mild flavor and a firm flesh. Garden care: Prepare the ground well before planting. Prune in winter, cutting out dead or damaged branches. In spring, feed with sulphate of ammonia, sulphate of potash and bonemeal and top-dress with ericaceous compost. One of two blueberry shrubs purchased, little dissapointed compared to the other blue bush. Has been playing catch up all year any not looking to strong for year two. Maybe wrong and could surprise us later in the summer!